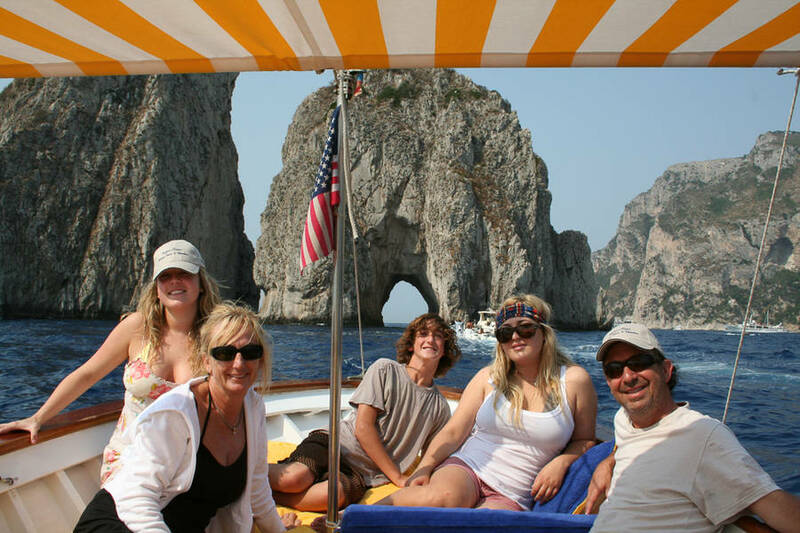 For travelers who have limited time to discover the island, or for those interested in a personalized private shore excursion experience, Capritime's Capri Day Tour is designed to introduce you to the island's highlights while moving around the island with maximum flexibility and avoiding the maddening crowds associated with large group travel during cruise docking days. Our Capri day tour begins with your arrival on Capri with a wonderful private boat tour in one of our traditional Capri boats known as a "gozzo". During our Capri boat tour we circumnavigate the entire island and, seas permitting, enjoy visits to the various caverns so characteristic to Capri, such as the Blue Grotto or the spectacular White Grotto. Naturally, there is time to enjoy a refreshing swim during our Capri boat tour so be sure to wear your swimsuit! Following our private boat tour, you will have the opportunity to visit the towns of Capri and Anacapri, the two towns of the island. Our traditional tour includes a leisurely walk through Capri to the Gardens of Augustus and then continues in Anacapri for a visit to the fabulous Villa San Michele or a scenic ride up Monte Solaro, the highest point of the island. For the hiking enthusiast, we can enjoy more strenuous walks up to Villa Jovis, the most important of the 12 imperial palaces built during the reign of Caesar Augustus and Tiberius, or a nature walk on Monte Solaro. The Fortress walk is another option for a strenuous hike. It is a rocky path which links the fortresses of the western side of Capri. This walk is not suitable for those suffering from vertigo. Capritime can also arrange private luxury speed boat transfers to and/or from the island for those who wish to completely avoid the crowds at the tourist ports.